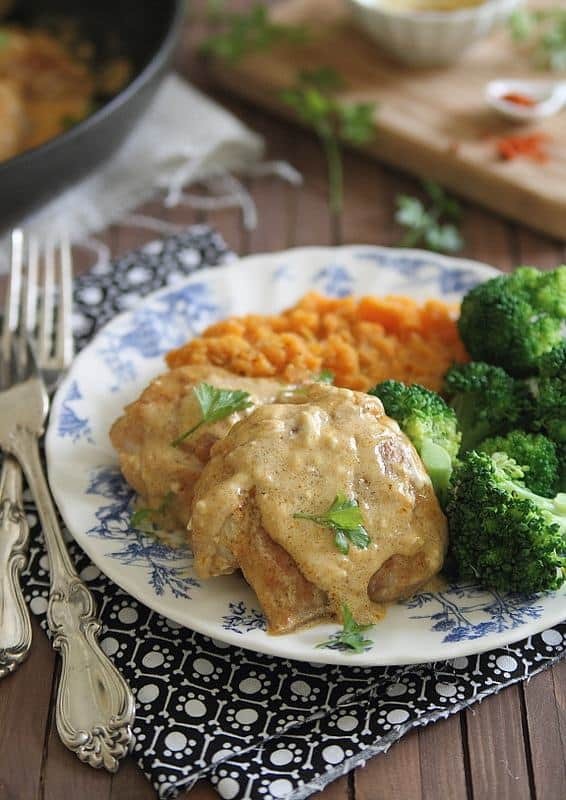 This cream cheese chicken is your answer to boring weeknight meals! Seasoned with 5 flavor-packed spices, it’s creamy, indulgent & full of savory goodness. Lately, I’ve taken on a bunch of extra recipe development work which has left me with ingredients I never typically buy in my fridge, like cream cheese and heavy cream. There could be way more unfortunate foods to be stuck with, right? I have a firm rule of never throwing food or ingredients away if I can help it. You’d think I grew up in the depression era or something because it literally pains me when people throw out food. I know so many of my food blogger friends do this all the time but I just can’t bring myself to open that trash can. It’d probably be a lot less work to stay fit if I could but…oh well. After a week of a tablespoon of heavy cream in my coffee (omg, delicious) and a container that was still 3/4 full, I decided something needed to be done because at that rate the cream was going to expire before I came anywhere near to finishing it. So, this creamy cheese chicken dinner that’s maybe a bit more indulgent than my normal chicken dinners was created. 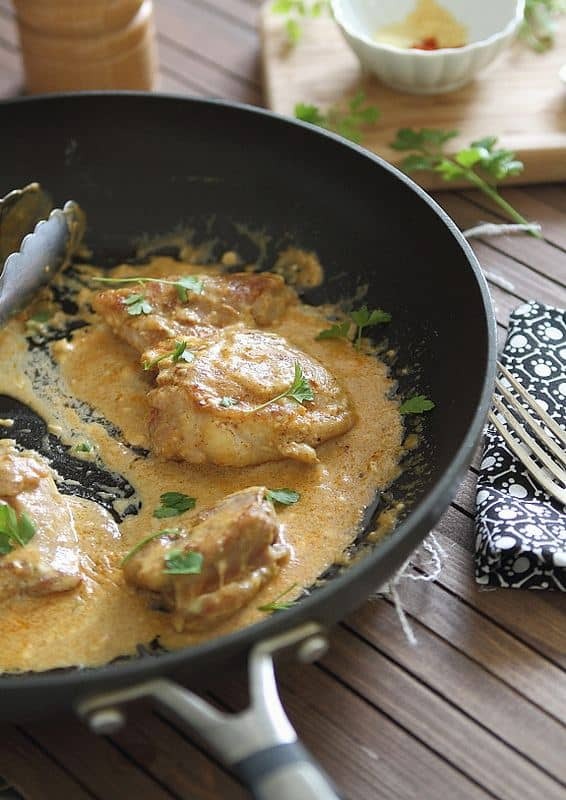 If you like spice, decadent cream sauce and a fast weeknight meal (um, who doesn’t? ), this recipe is for you. How Do You Make Cream Cheese Chicken? While it may look indulgent and you’re probably thinking this chicken dinner is a calorie bomb, I’ve got good news for you, it’s not really! That’s it. That’s really not so bad when divided into 4 servings yet you’re left with a super indulgent tasting creamy cheese sauce that will definitely put this dinner on the regular rotation. What Do I Serve with Cream Cheese Chicken? The side dish options are endless! If you want to keep things healthier, I’d suggest a simple green vegetable like grilled broccoli or basil mint squash noodles and a nutrient packed starch like goat cheese and spinach mashed sweet potatoes. Roasted potatoes are always an easy option too and these peri peri potatoes have a nice spice level that would go great with the cream cheese chicken. If you want to play up the indulgent theme, try this cauliflower bacon gratin or this broccoli cauliflower parmesan gratin. 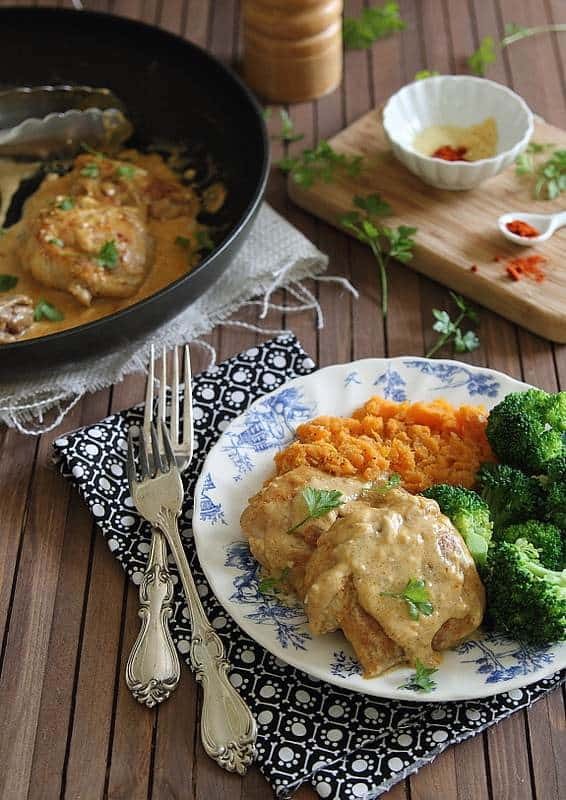 This cream cheese chicken is your answer to boring weeknight meals! Seasoned with 5 flavor-packed spices, it's creamy, indulgent & full of savory goodness. Combine the salt and spices in a small bowl. Sprinkle the seasoning onto both sides of all the chicken pieces, rubbing it into the meat. Place the butter and olive oil in a large skillet over medium-high heat. Once hot, add the chicken. Cook for about 3-5 minutes per side until golden brown. Once cooked on both sides, reduce the heat to medium-low and add the heavy cream, milk and cream cheese. Stir to combine and coat the chicken in the cream mixture. Let the sauce thicken for about 3 minutes. Plate the chicken and pour the sauce over top. You might be horrified to look into my fridge – because today I went to Costco and just bought a whole half gallon of Heavy Cream. I know – it’s awful. But it’s the holidays and it gets used (mostly in things I’m taking to work – because LAWD knows that Ican’t consume all that ish!!) Anyway – I’m so digging this its insane!! Looks gorgeous. I made this for the third time tonight! The second time I made it the cream cheese wouldn’t melt completely and the sauce was greasy, so tonight I removed the chicken and made the sauce and it worked great. I also doubled the recipe since I cook for myself, my husband, and our roommate and I need enough for dinner and lunch the next day. Thank you! Made this for dinner tonight and it is delicious!!! All 5 of us love it and I, the chef, love how easy and quickly it came together. Thanks for a great recipe!! were do you get the adobe seasoning? I’ve not seen that. Can you not? If you live in Texas you can get it at HEB most deff. If not it’s a GOYA product, that normally you can find near the rice and bean area, or at a more Hispanic cultured grocery store!! Hope that helps, if not Adobo is a mix of just a bunch of other seasonings so you might be able to look up the label and use the spices they list on the front of the bottle. I get it at our local Target store in the seasonings aisle. You can get adobo seasoning in most grocery store in the Hispanic section. I threw all of this in the crock pot today. I added the milk, cream cheese, and heavy cream for the last half hour. It was absolutely amazing I’ve some pasta!! What are the directions for the crockpot? This isn’t a slow cooker recipe, not sure what you mean. It’s meant to be cooked on the stove top as the recipe states. Had this last night for dinner. WOW! So good! Some things I did a bit differently: I removed the chicken after it was all done. I then deglazed the pan with some white wine. I then premixed the milk, cream cheese (and an extra 2tbs of heavy whipping cream). After the wine deglazed, i added all the dairy products to warm up, then added the chicken back in to warm all up. This was so quick and easy and yummy! Great for leftover lunches too! So glad you liked it and made it your own! Thank you so much for sharing this recipe! The entire family devoured it – even my ‘picky eaters.’ This is definitely going into the dinner menu rotation. This was fantastic. My husband and I loved it, even as leftovers. Because we are eating low carb, I did substitute chicken broth for the milk. Thank you for sharing this recipe. It is a keeper! I cook a lot, love savory recipes. Your recipe was delish and easy. I did not have adobo spice but, looked it up on pintrest and made it myself as I have a drawerful of spices. Chopped cilantro works as well as the parsley. Will definitely make again, thanks for a great meal idea! Luv the food photography, remember we eat with our eyes first! I made this delicious recipe tonight and my “I HATE CHICKEN’ hubby said he really liked it!! I had to look up adobo seasoning, and just ended up adding a few spices to the mix to replicate it. Hubby noticed the hint of spice in it and liked that too. I cut thick chicken breasts in half to make them thinner and to make them cook quickly. I used almond milk and half and half, because that’s what I had. The sauce was awesome! I wanted to lick my plate! I was planning to roast sweet potatoes and broccoli anyway, so our dinner looked a lot like your photos. I mistakenly reached for cilantro instead of parsley in my fridge, but it turned out to be good on the chicken. This recipe was so fast and easy and company worthy. Thank you! First, let start off by saying how pleased I am with reader response to this recipe. It drives me crazy when I read through recipe comments and all it says is “can’t wait to try it!”, “looks delish”, etc. I want to know how it actually cooked and tasted! So thank you everyone for good posts! Now, the recipe was great. I love dark meat, so any recipe with thighs is solid in my book. Loved the flavor, it was easy to make, and my biggest thumbs up to the fact that it’s made in one pan. Those recipes are life savers! Per previous posters, I did double the sauce (I also had double the chicken, because let’s face it, no grocery store sells “a pound of chicken”). Everyone’s kitchen is different, so it took me a little longer to cook the chicken thighs per side (and partly out of fear of undercooked chicken). All in all, great job. Will make it again. I agree with almost everything that the last reader said. But I wanted to let you know know that this has become a staple in our house. My kids love it, and my husband and I do too. Sometimes he and I toss a little chipotle on ours to take it up another notch. Love it! This recipe is perfect for keto people! I was looking for something to come together quickly for dinner on a tired Friday evening. This got my vote, as I was thinking of a block of cream cheese in my fridge. So, time to get the cheese out, remembered I used it in another dish recently. Ended up just using extra cream, and it worked splendidly. I had a package of six very small thighs, and your cooking times seem awfully short. I had to give mine some extra time in the pan. Also, I had a carrot that needed to be used so I threw it in the pan. It took to the creamy sauce deliciously. This just goes to show how flexible this recipe can be, considering the other comments here. And I agree that I prefer reading comments from people who actually made the dish. “Yummo” just doesn’t swing it when I’m trying to make a dinner decision. Thank you for sharing this, I’m sure it will make plenty of repeat performances in my kitchen! While I thought that might not have been in the repeat column from my kids, it was a hit! I used coconut milk and did add a little bit of honey to tame down the spice a bit. Little strong for my 4 yr old! Served it with steamed broccoli and over mashed butternut squash. My boys devoured this meal! (14, 10, 8, 4) They asked for it to be on the once a month list. Glad I found your recipe because chicken was getting boring around here! I made this recipe in my slow cooker for dinner tonight. It was really good! Got two thumbs up from my 10 year old, husband, and even my 2 year old devoured it. I put the thighs in the slow cooker, made the rub with the spices and sprinkled on top. I used chicken broth in place of milk and poured that over top and cooked on high for 3.5 hours, then added the cream cheese and heavy cream at the end. I added a little more garlic and salt at the end but overall it was great! Was missing a few ingredients so substituted my own, came out absolutely delicious & my boyfriend raved about it. Used chicken breasts, left out adobo seasoning, cayenne pepper, and ground mustard, instead substituted approx. 1/2 tsp red pepper flakes and 1/2 tsp chili powder. For the sauce, used sour cream instead of heavy cream, and also added 2-3 tbsp of chipotle peppers in adobo sauce (I used canned chipotle peppers & chopped them up before adding). Followed the rest of the recipe instructions and it came out super tasty, although a tad on the spicy side, so those of you who have sensitive taste buds like I do could adjust the amount red pepper flakes to taste. This was so good with the substitutions, I’m really looking forward to trying the actual recipe once I have all the ingredients! I just made this and it is amazing! Chicken is perfect and the sauce is FANTASTIC! Thank you for this recipe, will definitely be making it frequently.